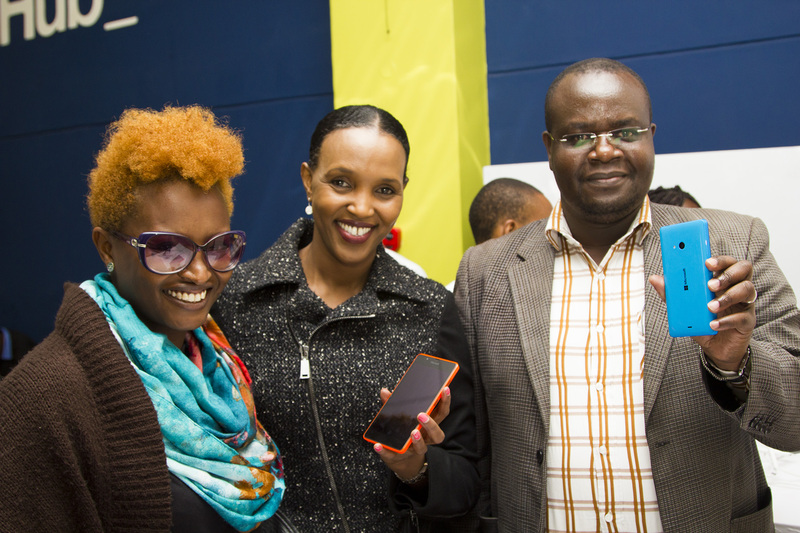 Lumia 540 Dual SIM Phone launched in Kenya…get one now! 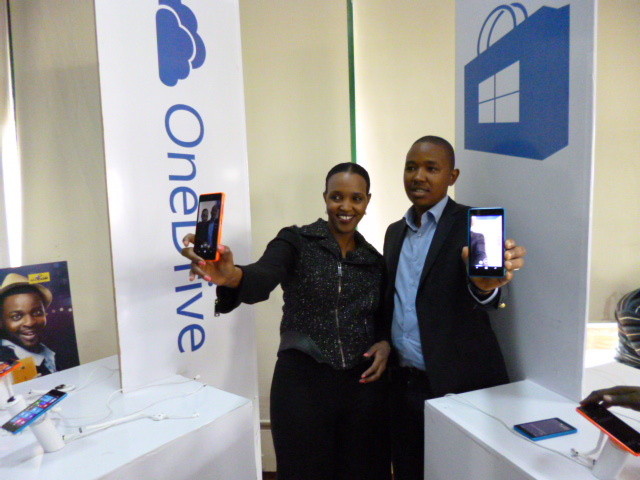 In the photo below are Mariam Abdulahi, Microsoft Mobile GM with King’ori Gitahi Product Manager displaying the Lumia 540 launched yesterday at the iHub in Nairobi. Designed for young, ambitious people looking for their first serious Smartphone. 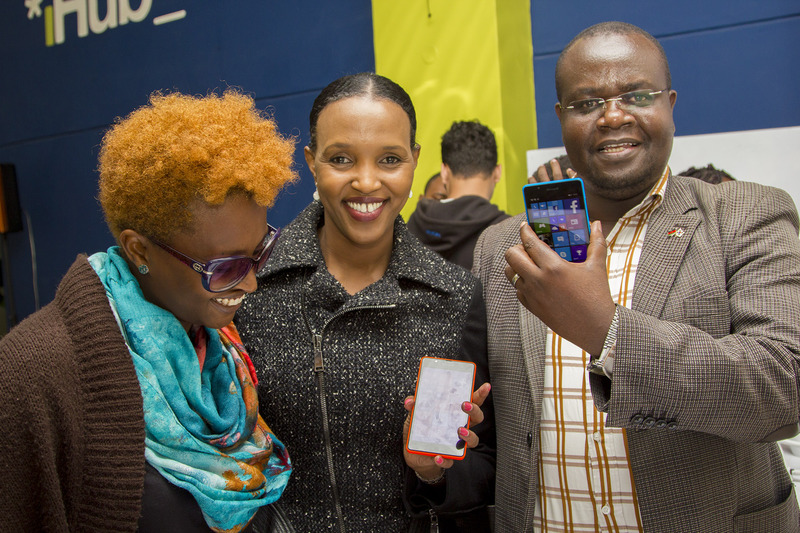 Microsoft today announced the availability of the Lumia 540 Dual SIMin Kenya for Kshs 17,800-a smart choice for value-conscious Smartphone buyers. Upgradeable to Windows 10 when the service becomes available later this year, the quality-crafted Lumia 540Dual SIM features a crisp, clear, 5-inch HD display; 8-megapixel rear-facing camera with LED flash; and 5-megapixel front-facing camera that’s great for taking wide-angle selfies. Instantly upgrade phone calls into video calls with the touch of a button, using the pre-loaded Skype service and front-facing camera. Achieve more, even on-the-go, with Microsoft Office; and connect with work and personal e-mail with the built-in Microsoft Outlook. Save and sync photos, videos and Office documents securely with up to 30GB of free cloud storage with built-in OneDrive. Store your personal music collection on OneDrive and use free and paid for apps to stream across devices and the web. Personalize the home screen with all your favorite apps,including WhatsApp, Facebook, Instagram, Twitter, Minecraft,and many more available from Windows Phone Store. Ensure you never miss a call with Smart Dual SIM. 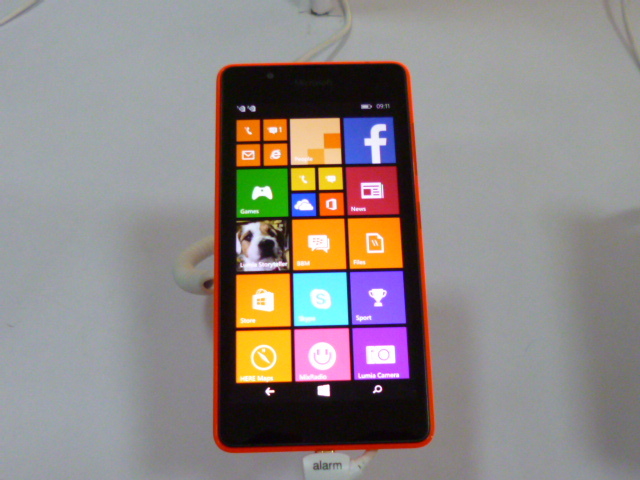 With its generous HD display, front and rear cameras,great apps, andMicrosoft Office, Skype and OneDrive built-in, the Lumia 540 Dual SIM is a well-rounded package at an appealing price. “A study conducted by our partner – Jumia Kenya discloses that top smartphone purchase drivers include Battery capacity, brand type, Camera / imaging capability and price. With this in mind, Lumia 540 is without a doubt, is a natural choicefor peopleready to experience their first serious smartphone. It provides the essentials you need to achieve more every day, alongside popular apps and smartphone experiences that make using the smartphone great fun,” added Mariam. Choosing which language to use for an Internet of Things project can be as big a decision as choosing a hardware platform. Here are 11 options to consider for your next coding project. Internet of Things (IoT) development projects are springing up at businesses all over the world. New hardware platforms make embedded systems in IoT applications easier to engineer than ever before. Once you’ve chosen the hardware platform, though, you still must develop the application software, and that’s where more (and often, more difficult) decisions must be made. Not so very long ago, your choice of programming language was pretty much dictated by your choice of hardware platform. More modern platforms that are based on open source standards and able to support multiple languages make for much more flexibility and, therefore, more choices. That’s where we come in. How do you decide which programming language to use in a particular IoT project? In some cases, your options still will be limited by your hardware platform. In others, though, you’ll be able to choose from a language based on factors such as whether your enterprise dev team is already familiar with it, whether it works within the environment used by other components of the total IoT system, or whether it produces code that is smaller, more efficient, or more rapidly written than that of other options. There are 11 languages that float to the top of the consideration pool when it comes to programming embedded systems. They range from general-purpose languages like C++ and Java to embedded-specific choices like Go and Parasail. Each offers advantages and disadvantages. After you’ve reviewed the following pages to see what we’ve come up with, meet us in the comments section below to let us know what your preferred language options are when you’re considering embedded and IoT development projects. The Raspberry Pi isn’t just a great platform for building Internet of Things project: It’s a super platform for learning about the IoT. Here are ten projects to help built IoT skills. The Internet of Things (IoT) is, arguably, the hottest topic in IT. Every organization wants to participate in the IoT, and many IT professionals want to know how to add IoT skills to their resume. There are lots of options for learning about IoT, but nothing really beats the hands-on experience. One of the key learning platforms for IoT is the Raspberry Pi. The RasPi is a popular platform because it offers a complete Linux server in a tiny platform for a very low cost. In fact, one of the most difficult parts of using Raspberry Pi for learning about IoT is picking the right projects with which to begin. If you go out and look on the Web you’ll find thousands of projects based on the RasPi. Some are ambitious, many are silly, and some are great for learning about both the Raspberry Pi and common components of the IoT. I went out in search of projects in that last group. What makes a great IoT learning project? In my opinion it takes a few things. The first is the use of some common sensor or controller types. I like custom-built hardware as much as the next geek, but for an education project you don’t really want to go wild with the hardware builds. Next, the project should have something interesting going on in the control software. While I don’t think you need an epic development project for a meaningful learning experience, you should really do more than just call pre-existing scripts and applications. Finally, the projects should be interesting and, dare I say it, fun. There’s nothing worse than training that feels like drudgery. Good training projects should make trainees really want to move forward with their education. That’s what I went looking for, and I found a variety of projects that met my requirements. Here are 10 of the ones that I thought were best. We start with one that takes the RasPi to new heights. YouTube’s been dealing with real competition in the last few years, and today it’s launching a new standalone app and site to maintain its grip on gamers’ attention. Facebook has filled its News Feed with viral videos, news clips, and anything else its users and the brands trying to reach them are willing to upload. Sites like Twitch now capture a huge portion of time spent watching videos by focusing on specific verticals of content, like gaming. What’s interesting is that, with the exception of premium sites like Hulu or Netflix, YouTube has a lot of the same content as its competitors. It’s a blessing and a curse: being a one-stop shop means you have to somehow match users with the right content at the right time. Today’s announcement of YouTube Gaming, a standalone app and site focused on video game related content, shows the company isn’t sitting idly by while outside forces steal attention away from its massive library of content. By building a product around a specific vertical, it can build an experience untarnished by the random viewing habits that can throw off its recommendation algorithms. Much like Twitch, YouTube Gaming has pages dedicated to specific games — more than 25,000 of them. Each page shows collections of channels, videos, and live streams featuring content from or related to that title. Users will be able to follow these pages to see new videos as popular creators release them or as new creators hit it big, taking some of the difficulty out of finding and subscribing to interesting videos. In addition to the details released today, YouTube says it’ll be rolling out changes to its livestreaming tool to simplify the broadcasting experience. Streamers will no longer be required to schedule a live video ahead of time, and a single link will point to a user’s live streams so users don’t have to share new links across their social channels every time they go live. YouTube Gaming will be available in the U.S. and U.K. this summer. The Google-owned company declined to pin down a precise date. Though they get the most attention, it’s not just on-demand companies that employ significant contract workforces. Microsoft has nearly two-thirds as many contractors as full-time employees. Even the simplest business structures, sole proprietorships, have increased their use of contract workers nearly two-fold since 2003. Four trends are converging to make contracting more attractive for both employers and workers, and reshaping how businesses and employees look at the traditional full-time model. Historically, contractors have needed serious hustle to get referrals, early customers, and a stream of repeat business. For local services, platforms such as Homejoy and Handy upend that dynamic. These platforms take on much of the marketing, job finding, payment and management costs necessary to run a small business. Local service contractors join the platform and are quickly plugged into a stream of consumers. One Homejoy cleaner says, she’s “never been busier.” She just needs to say when she’s available, show up for jobs and do the work. For knowledge workers, platforms such as Upwork fill a similar gap. Workers around the globe get access to a pool of potential customers. Payment collection and reporting are handled by the platform, which means contractors, whether working from their kitchen or a beach in Thailand, can focus narrowly on doing the work they do best while the platform handles the less glamorous parts of the business. Businesses themselves are benefiting from this simple, streamlined way to source contractors, as well. With flexible human capital, they seamlessly develop the ability to rapidly scale up and down. By becoming less of a “within these four walls” entity to something that’s much more amorphous, they can focus on assembling the right talent at the right time to accomplish a given project. It’s similar to a movie set: A director assembles the people with the skills necessary to create a complete movie (casting, lighting, grips, sound, etc.). They come together and focus intensely on one project and then disperse when it’s complete. It’s very different from a business world that’s typically described with a rigid org chart, but still highly effective. The people entering the workforce today value flexibility and autonomy; they choose location over career and job rotation over promotions. According to the Bureau of Labor Statistics, the average 55-year-old spends 10 years on a job while the typical 25-year-old spends three. This younger cohort will even choose flexible schedules and remote work over increases in salary. The idea of lifelong employment with a pension no longer applies (and those pensions aren’t sticking around, either). Recognizing these trends, Google and Facebook offer rotational development programs specifically designed to attract young talent. Reid Hoffman, co-founder of LinkedIn, advocates for employees to sign up for two-year “tours of duty” to accomplish something significant for the company before moving on to the next thing. Contractors can focus on finding work that matches their skills and will pay them well. But the timeframe changes — instead of working as an employee for a two-year stint doing largely the same thing, one- to six-month projects for various employers are becoming the norm. Within the on-demand economy, it’s accelerated even further. Many contractors work for multiple companies in a given week — with some working for as many as 10. The “9 to 5” has all but disappeared. While the downside is less job security, the flexibility afforded is desirable to many. People are terrified of losing their health benefits — and rightly so. The risks of going without health insurance are high — a single accident could be financially catastrophic. Therefore, many would-be entrepreneurs delay leaving their employers. It’s not all sunshine and roses. Contractors don’t have many of the legal protections that employees have — they’re vulnerable, wages can be suppressed and individuals can become little more than cogs in the machine. Fortunately, dozens of services are popping up to fill this void and support the growing contractor class. Freelancer’s Union offers insurance tailored to the needs of independent workers. Peers.org provides a community to better understand what wages contractors can expect to make. QuickBooks Self-Employed offers financial and tax tools. And there are even digital nomad communities popping up around the globe for those who don’t need to be tethered to one spot and apps like Teleport to help contractors find them. This burgeoning ecosystem is closing the “benefits gap” between employees and contractors. When a person can get insurance, community and financial help without traditional employment, it raises the question: Why be traditionally employed? Technology platforms make it easier for contractors to get customers or work from around the globe. Health coverage can be acquired. Communities and tools exist to help contractors get the most out of their finances. That’s why it’s projected that over 40 percent of the workforce will consist of contractors just five years from now. Individuals are looking at their job options and choosing contractor work—essentially starting their own businesses. For these people, it’s not so much about “taking the leap” anymore. It’s about taking the next step. For businesses, the changes are just as significant. Ultimately, businesses will consist of owners, talent assemblers, and contract workers for everything else. Platforms will spring up that know what contractors have certain skills, what they’ve done, and whether they’re available. Contractors will get instantly matched with talent assemblers. Entire teams could be hired with the click of a button. The implications are profound. This shift will cause discomfort and dislocation as all shifts do. But, in the long-term, as the support scaffolding for both businesses and workers is put in place, a more dynamic economy will emerge. 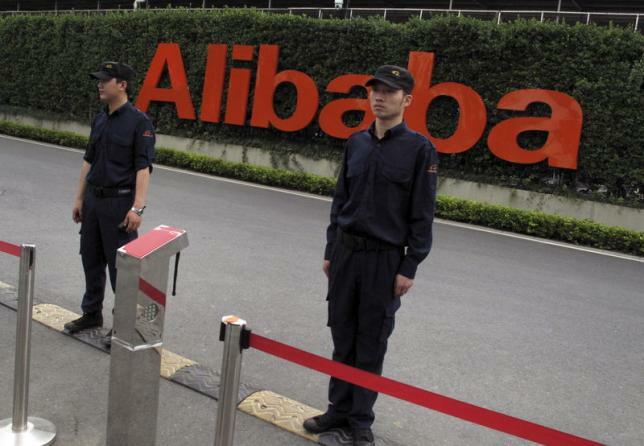 Alibaba Group Holding Ltd (BABA.N) will launch an online video streaming service in China in about two months, hoping to emulate the U.S.’s Netflix Inc (NFLX.O) and HBO, the firm’s head of digital entertainment said on Sunday. The service will be called ‘TBO’, or Tmall Box Office, with content bought from China and other countries, as well as in-house productions, Alibaba’s Patrick Liu told reporters in Shanghai. TBO will launch into a competitive online video market in China, where companies are spending billions of dollars to buy media content to attract enough viewers to become dominant. Alibaba’s new service will go up against the likes of Tencent Holdings Ltd (0700.HK), Baidu Inc’s (BIDU.O) iQiyi, Sohu.com Inc (SOHU.O) and Leshi Internet Information & Technology Corp Beijing (LeTV) (300104.SZ). It was not immediately clear how the service would fit with Youku Tudou Inc (YOKU.N), one of China’s biggest video streaming platforms in which Alibaba bought a 16.5 percent stake last year. However, unlike the majority of domestic rivals, about 90 percent of TBO’s content will be paid for, either by monthly subscription or on a show-by-show basis, Liu said. The remaining 10 percent would be free. Netflix itself is also considering an entry into China, a notoriously difficult task for foreign Internet companies. A hacker has forced Uber to take its online petition site down after exploiting a vote-spamming flaw which he said was “super easy for the developer of the website to prevent”. The hacker, going by “Austin”, found the flaw on 12 June after searching Google for petition and contest sites with the intention of writing a blog post about how both tend not to be secure against fake entries. Finding an Uber petition asking for access to Market Street in San Francisco as a featured result, he realised it was being hosted by the company itself and wondered how smart it was. The answer, apparently, was not very. When Austin discovered that he could enter his zipcode as “zipcode” rather than a traditional postal identifier, he decided to play around with the web form to find out what else it would accept. The answer was pretty much anything, meaning he was able to insert comment indicators (<!- and ->) as well as insert an iframe which he used to direct visitors to Uber’s petition site to rival site Lyft.com. That diversion stayed in effect for two hours. Austin, who said that he had not attempted anything more malicious, highlighted a few examples of what else could be done with Uber’s petition site, such as inserting malware or phishing links. Thanks Uber for making it so easy to manipulate your website. It's been a great educational experience, but please don't do this again. Whoever wrote your script was in a hurry to get home. Whoever developed your webpage literally copied and pasted code from an online tutorial that promotes itself as being very simple code. I'm serious. The hacker, who says he threw 100,000 signatures at the online petition using various clicking scripts, even overlaid his own webpage at one point, suggesting visitors should add their endorsement to turning a road into a slip-and-slide “party machine”. At the same time as I started this demo, I notified someone at Uber who immediately notified the appropriate people. I had also contacted Uber a couple days ago informing them I had found an exploit that I was preparing to reveal in this manner. Uber took down the website and redirected the page to their employee login portal first. It now no longer redirects the page; however, it asks for server authentication when anyone tries to load the page. They emailed me saying they are working on it. Austin finished his blog post by suggesting that Uber could fix its site by limiting the rate of submission inputs and by at least partially validating inputs. The petition site is still down. Uber has had its fair share of security and privacy issues in the past. In February this year, an internal lost and found database containing customer and driver information was made public for a short while. And late last year, the company accessed a late-running reporter’s data on two occasions and gave a job applicant access to passenger data for several hours. Password management service LastPass has issued a security notice that its network has been breached – but claims no encrypted user vault data was taken, nor accounts accessed. However, the notice said LastPass account email addresses, password reminders, server per user salts (see below) and authentication hashes were compromised. “We are confident that our encryption measures are sufficient to protect the vast majority of users,” Joe Siegrist said in a blog post. According to security expert Paul Ducklin, LastPass does a good job of storing its password representations because passwords are salted, hashed and stretched, and only ever stored in that scrambled, irreversible form. “Salting is where you add some random nonsense to the actual password text. So even if two users pick the same password, their password representations end up different. Hashing is where you scramble the salted password cryptographically and store the one-way scrambled version only. Stretching is where you deliberately re-run the hashing part over and over again before storing the representation, to slow an attacker down,” he wrote in a blog post. According to the security notice, LastPass strengthens the authentication hash with a random salt and 100,000 rounds of server-side PBKDF2-SHA256, in addition to the rounds performed client-side. “This additional strengthening makes it difficult to attack the stolen hashes with any significant speed,” the security notice said. However, LastPass said all users who log in from a new device or IP address will be required to verify their account by email if they do not have multifactor authentication enabled. The company also plans to send all users an email about the breach, prompting them to change their master passwords. “You do not need to update your master password until you see our prompt. However, if you have re-used your master password on any other website, you should replace the passwords on those other websites,” the security notice said. LastPass said there is no need to change any passwords stored in the LastPass vault because encrypted user data was not taken, but the company recommends enabling multifactor authentication for added protection. LastPass enables users to choose from a variety of second-factor authentication methods, including USB keys like YubiKey and Sesame as well as biometric authentication methods. The company said it is working with the authorities and security forensic experts. Independent security consultant Graham Cluley said LastPass users should be careful with any email they receive from LastPass. He points out that the compromise of account email addresses presents an opportunity for phishers and identity thieves to commit email-based attacks posing as LastPass. “As always, don’t panic. The sky is not falling. Take sensible steps to better secure your account – LastPass’s advice is good,” he wrote in a blog post. Cluley said he hoped LastPass will eventually be able share more information about precisely what happened and reassure customers that it will not happen again. A new report indicates that the Samsung Galaxy Note 4 Android Lollipop 5.1.1 update is currently being tested for eventual release. AnTuTu benchmarks were seen showing the OS update running on the device. The Samsung Galaxy Note 4 Android Lollipop 5.1.1 update is coming soon, according to a new report. In addition to addressing numerous issues users have had with the Android 5.0 Lollipop update, the new version reportedly may come in a 64-bit build. It’s no secret by now that many Galaxy Note 4 users have not been happy with the Android 5.0 Lollipop update they received for their phablets earlier this year. The update wreaked havoc with many users’ devices, causing problems such as overheating, forced closing and freezing of apps and missed notifications. The most widespread problem of all has been decreased battery life, with many Note 4 owners reporting that their smartphone battery drains ridiculously fast since the Android 5.0 Lollipop update, even while the device isn’t in use and with no apps running. Galaxy Note 4 owners looking for a fix have been told to perform a factory reset on their phones, which helped some but not others. Some carriers, notably Verizon in the U.S., released small incremental Android 5.0 Lollipop updates meant to address the issues, often to no avail. Now, it appears there is finally hope on the horizon for Note 4 owners. A new report indicates that the Android 5.1.1 Lollipop update may be on the way shortly. 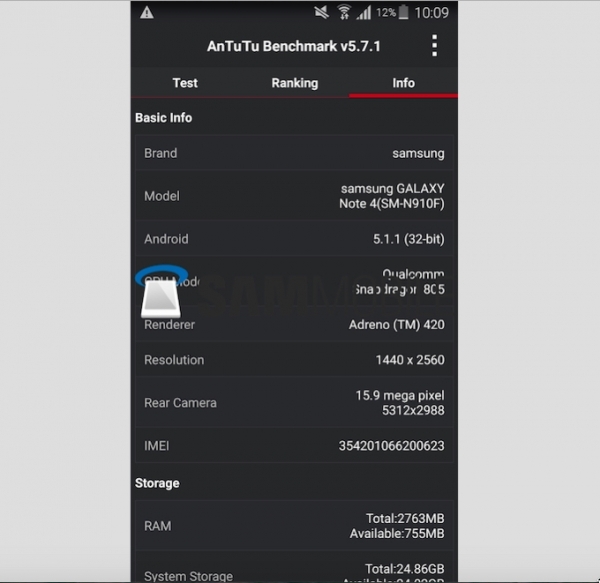 An AnTuTu benchmark shows the update running on the Galaxy Note 4, possibly with a 64-bit build. In addition to the expected bug fixes, users can expect to see a host of performance improvements on their phablets. While Galaxy Note 4 owners are anxiously awaiting a new update for their phablets, the Galaxy Note 5 is on the horizon and is set to be introduced at IFA Berlin in September. Rumors have been swirling that the latest flagship version of the popular Note series will be the first Samsung device to feature Android M, which was recently unveiled at Google I/O, but this currently appears unlikely as Samsung will need time to test the new OS following its completion and release. Photo : June | YouTube. June Intelligent Oven has a camera and Wi-Fi connectivity so that users can see a live video of food being prepared. The smart oven will be released in Spring 2016. A team of developers have created the June Intelligent Oven, a computer-based appliance that thinks like a chef and prepares the perfect meals. The oven can easily fit on kitchen countertops but is still large enough to roast a full chicken. June can be used for baking a 12-inch pizza or preparing an elaborate roast on those special occasions. The intelligent oven has a 21-inch window and two LED lights that allow users to see how their food is coming along. June has a 5-inch touch display and click knob that provides easy control and brings in modern technology with touch screens and Internet connectivity. A 2.3GHz Quad Core NVIDIA Processor with 192 Cuda Cores is included in the oven, which also has an HD camera, kitchen scale, and dual-surround convection for faster and even cooking, as well as carbon-fiber heating elements. Users can download the June app for controlling the oven and monitoring cooking with a live video on an iPad or iPhone. 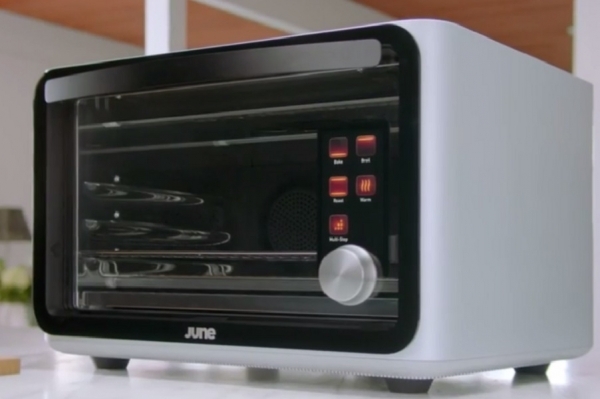 June partnered up with Ammunition, a San-Francisco based firm, to design the oven. The smart oven’s press release emphasizes that it can serve up the most popular meals, and it can also be customized to suit individual tastes — such as programming the oven to cook steak as medium, rare or well-done. The June Intelligent Oven also recommends how to cook a food item by analyzing the food type, internal temperature and weight. The intelligent oven is being offered at a special rate of $1,495 if booked before July 10. Upon launching, the oven will have a price tag of $2,995. Interested customers can reserve their oven from June’s official website. Check out this short video of June in action.